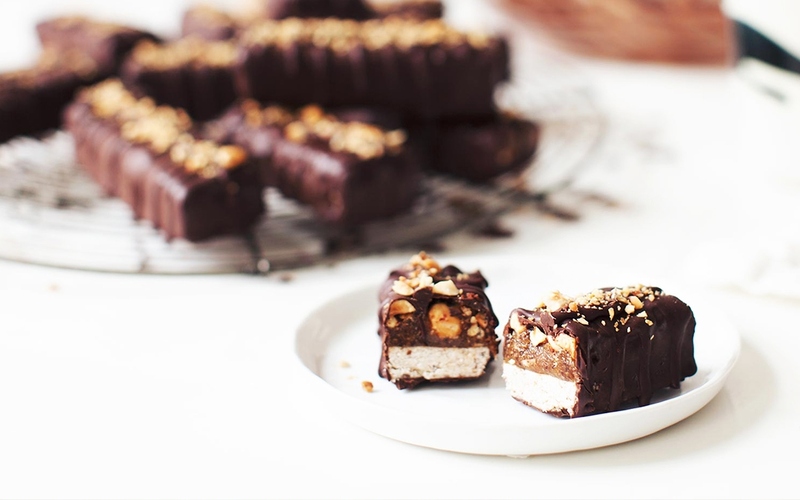 We had to share Sarah Britton’s unbelievable recipe for this awesome chocolate bar. Sweetened only with dates and maple syrup—and not too much—this offers a great low-sugar option to satisfy any sweet tooth. The nuts and coconut flour provide fiber and protein. Note that if making your own raw chocolate isn’t in the cards for you, Britton offers a store-bought option for the chocolate ingredient. Want to see more of her amazing plant-based recipes? Visit her gorgeous blog, My New Roots. Note: Raw chocolate can be substituted with two 3½ oz bars of dark chocolate (minimum 70 percent cacao). Start by making the cookie bottom. In a small bowl, stir the applesauce and the ground flax together. Set aside and let gel for 15 minutes. Preheat the oven to 350°F/175°C. In a large bowl, sift together the coconut flour and sea salt. Stir in the melted coconut oil, two tablespoons of maple syrup, the applesauce-flax mixture, and blend until the mixture holds together when pressed. If not, add the remaining tablespoon of maple syrup and stir to combine. Line a brownie pan with baking paper and firmly press the mixture into the pan, especially around the edges. Place in the oven and bake for 12–15 minutes until the edges are beginning to turn golden. Remove from the oven and set aside to cool at room temperature. Lower the oven temperature to 300°F/150°C. Spread the nuts out in a single layer on baking sheet and roast for 20–30 minutes until fragrant and slightly darker in color (a good way to check is to cut one in half and check the color in the center. Instead of cream, it should be golden). Remove from oven and let cool completely. If you are using hazelnuts, rub them together to remove as much of their skins as possible. Roughly chop and set aside. Make the nut caramel. Add the pitted dates to a food processor and blend until creamy. Add the nut butter, vanilla bean, and sea salt. Taste and adjust according to your tastes. Spread the nut caramel in an even layer over the cooled cookie bottom. Cover the caramel with the chopped toasted nuts, and press them down so that they are slightly sunken, reserving a few for garnish. Place the pan in the freezer to firm up for at least 4 hours (frozen bars are easier to cut and coat with chocolate). Prepare the chocolate. Melt the cacao butter in a double boiler over barely simmering water. Remove from heat, stir in the maple syrup and salt, then sift in the cacao powder. Whisk together until smooth. Remove the brownie pan from the freezer and pull up the edges of the baking paper to remove the filling. Place on a cutting board and slice into 16 equal bars.